1)	Hannah B as the Bachelorette! I haven’t been this excited about a lead in awhile. Not only am I glad that she is the Bachelorette, I’m glad for her sake that she won’t end up in Paradise with Caelynn. I think we all have THAT person who brings out the worst/crazy in us, and it seems like Caelynn is that person for Hannah. I think everyone was over the Caelynn/Hannah B feud. Especially when it’s apparent neither of them is ever gonna go into any detail about it. 2)	I have a question/theory about the fence jump last night. Chris doesn’t actually hang out on site of the fantasy suites does he? I’m guessing that they brought him in later to film his reaction to the jump and said, “Go look for Colton like your dog ran away from home.” Any thoughts on how this actually went down? I mean, he’s there in Portugal, but it’s hard to know exactly what went down. Maybe when they saw things were going south with Cassie, they called him up and said we might need you to talk to Colton after this tonight since it doesn’t look like Cassie’s staying. So he was close by to talk to him, then Colton bolted. Or like a previous emailer said who works in production, we never technically saw Chris and Colton in the same shot when he was “chasing” after him, so it could’ve been filmed after the fact. We just don’t know. But both are viable options. 3)	The longevity of Colton and Cassie. Based on what I’ve read about her indecisiveness with her previous boyfriend and what we saw on their date last night (seriously, how many times did she say “I Don’t Know”), they may last longer than I initially thought. As you mentioned in your column today, it is apparent that Colton is way more into Cassie than she is into him. So i don’t see Colton breaking up with her anytime soon. And based on her inability to have a clean, permanent break up with her last boyfriend, I’m not sure she would be able to break up with Colton either. Any other 2 people in this situation, I would give until the end of summer. I think Colton and Cassie may see 2020, even though this relationship is doomed and they are never getting married. Yeah, to me, they are never getting married, so predicting they’ll make 3, 6, 9 months or whatever is pretty pointless. It’s “Do you think they’ll get married eventually?” And my answer is a resounding no. 4) On one of your recent podcasts, I believe you mentioned your site numbers being stronger than ever. I would love for you to do a poll to see if people are reading your site and not watching, watching only because they read your site, or watch the show regardless. I think it would be interesting to see the results. I’ve been a religious reader and was planning on just reading your site for this season. But then, damn, an ending we’ve never had before drew me back in to watch. Comment: Definitely can do that in the future. 1. You said in your recap, that F***ing Randolph “is a logical guy” and while I totally agree with the points you are making about him telling Cassie it’s ok not to not be ready for engagement in this short amount of time, I feel you are failing to mention the illogical side of him. He isn’t a totally logical guy because to say if doubts or questions during a relationship means you shouldn’t marry someone, or be with someone because “he never had doubts with his wife” is totally illogical! He is the exception, not the rule. MANY people have doubts, have bumps in their relationship, have to work through things, have doubts and MANY people end up happily married. I think that idea is unrealistic, illogical and I feel he is missing the mark. Just because Cassie had doubts doesn’t mean it couldn’t have worked out. Unfortunately, it’s far more than that and after watching the episode it’s obvious Cassie is just not that into him. I mentioned that last week that people would be coming for him with that quote, but forgot to mention it yesterday. You are right. That’s unrealistic that every single couple that’s married knew right away about their spouse. I’d love for him to expand further upon that because it does seem kinda ridiculous to think that. 2. Do you think if Cassie’s 1-on-1 date was earlier in the season this could’ve played out differently? She keeps mentioning needing more time and I can’t help but to think what could have happened if hers was earlier in the season. And the fact that someone like Tayshia had 2 1-on-1’s before hometowns. Your personal opinion on this? I don’t see it being that big of a difference, honestly. I think Cassie’s struggles would’ve been the same. Whether she had one or two 1-on-1’s with him, just like any season, at the end of the day, this person you’re supposed to get engaged to at the end is someone you barely know, and what you DO know of them, is in this insulated bubble on a TV show. As I say every season, the relationship doesn’t start until after the cameras stop rolling. All you’re doing on the show is finding out surface level stuff about them and if you’d want to continue dating them. 3. I know you have said that you thought Colton was indeed into Cassie and while I have questioned his intentions all season, him shaking in the episode and showing a side I have never seen in any other episode of the Bachelor, proved to me (in the saddest way) that he is totally in love with her. The shaking was out of control. That is all. Comment: Maybe it was cold. I shake when I’m cold. Big fan of your blogs and recaps. Regarding Hannah B as the Bacherlottete, doesn’t filming begin right after Colton’s season wraps up? When should it be expected to air? Filming starts next Thursday, the 14th. It will end filming first week of May, and “Bachelorette” usually either debuts on Memorial Day, or second to last Monday in May. Regarding Matt’s appearance in the show, does anyone know if Colton was aware her dad came? I can’t recall her mentioning it during her walk out. I don’t think he did. The breakup scene was so long I actually fell asleep during most of Cassie’s IDK. The fence jump was the only thing that semi woke me up. Also isn’t Arie married? Wouldn’t it be two married couples from the Bachelor franchise? Comment: Married to the final woman he chose has only happened once, and that’s Sean and Catherine. Got a couple of questions, since you said you were light for reader emails this week: Boy, did I ask for it by saying that. 1. Do you know who else was in serious consideration for Bachelorette? Did they ask Hannah B. first, or was she 2nd/3rd/etc choice? If she was 1st choice, who would have been next if she said no? From what I hear, it was between the two Hannah’s. Caelynn wasn’t even an option. Probably why she’s taking the stance she is now. 2. Did Hannah G. do something to piss off production? It seems that other than the first night and one-on-one date and hometown, her footage has been largely missing, which seems odd for a final 3. No. I just think some people every season manage to stay drama free, which is fine for them personally, but for the viewer, sometimes that doesn’t necessarily mean it’s a good thing. 3. Of the women from Colton’s season, who would you have picked as the next Bachelorette now that you have seen almost all of the shows? Why? Is there someone from a previous season you would choose? Why? I would have been fine with either Hannah. No one else from this season I could’ve seen in that role. Past seasons? I already posted those last week when I showed that the top 4 women in the last 3 Bachelor seasons are all in relationships. I even took it back to a 4th season (Chris Soules), and all his top 4 are taken as well. So that’s the top 16 women over the last 4 years who couldn’t be Bachelorette. So now you’re picking from 5th, 6th, and 7th place from 2-3 years ago. Just never gonna happen. 4. 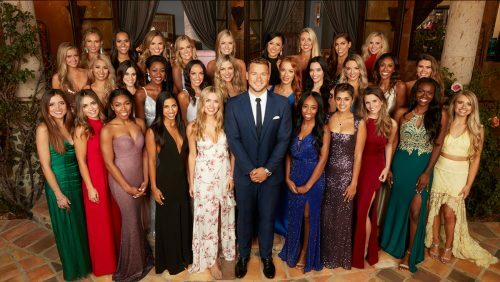 While I know it is unlikely they will pick a bachelor/bachelorette from outside the franchise at this point, is there someone you think would be a good choice that isnt currently part of the bachelor franchise and who would actually do it if asked? I would like to see them pick someone in their 30s again, the idea that someone in their early 20’s hasnt found love and is in desperate need of help is a bit ridiculous. Comment: I never think about it because it’s been 25 seasons in a row now they’ve recycled. I don’t see the point in trying to figure out who outside the franchise would make a good lead, because ultimately it doesn’t matter. 1. Are we sure they are still together? I know he was spotted working out with Michelle’s boyfriend but I just have 0 faith in them? Yes, they are. Doesn’t mean much since I can’t remember the last couple that couldn’t even make it to the ATFR. Matt and Shayne? Ben and Courtney were the two that almost didn’t since they did break up while the show was on, but they ultimately made up and lasted a year. 2. How does her dad play out in all of this? Cause it seemed like he wouldn’t even support them together? I think that’s the $1 million question right now. 3. If her sister is already “famous” and dating someone even more famous- does she really need the show to get followers? If you think not- why do you think she really went on? Cassie has 839k IG followers now. Her sister has 219k. And back in September before anyone knew who Cassie was, I believe she had under 10k. So that goes to show how important this show can be for people. We’ll see what she does with it post-show. I have no idea what she’s gonna do. 4. Do you think they have been getting men for the Bachelorette for Hannah B this whole time or did they think it was going to be Caelynn or Hannah G? That doesn’t matter to them. They’re casting a TV show. They’ll have a few in there they think Hannah B will like, but the contestants are always cast before the lead is. They just want good TV, not the 25 most perfect men on the planet for Hannah B. 5. From this cast- who do you think will be on paradise? Cassie has gotten a lot of crap for what happened, my favorite Instagram comment being “YOU ARE A TOILET” like of all the things to call someone… but my take on Cassie (since you care) is just that she’s a people pleaser. She wanted to make her dad happy and she wanted to make Colton happy and so she came off as being really ridiculous. I, myself, have had a really hard time breaking up with people for that exact reason. I think I broke up with and got back together with the same dude about 8 times before it finally stuck. So I relate. But really I wonder if the ads pay well enough to put up with the abuse that these poor people go through. No real questions, just had never sent one of these and felt like giving it a shot. Comment: I never watched either season of Young Once, but from what people are telling me, her indecisiveness about what to do about Caelan is playing out with Colton. People have told me she did the exact thing with Caelan on Young Once, so, I guess it’s not far fetched that she had this reaction. 1. In circumstances like this, do the producers somewhat fill Tayshia and Hannah in on everything that’s going on or do the girls literally find everything out once Colton breaks up with them? No. They will find out when Colton tells them. 2. Since Hannah B. was announced as Bachelorette, do you think Hannah G., Caelynn, Tayshia, etc. will all be on Bachelor in Paradise? Yes. 3. And then I’m not sure if you have answered this before, but when it comes to spoiling the Bachelor/Bachelorette/BIP series, what is your favorite part about doing this job? Are there ever times when it becomes stressful that you think about taking a break from spoiling the show? Comment: Nothing about my job is stressful. Annoying and repetitive at times? Sure. But it’s not stressful. Favorite part is spoiling in real time. Because it’s how I know no one will ever be able to beat me at what I do. Maybe some day someone comes along and can match what I do, but with as much as I spoil in real time, how can you beat that? Get in a time machine? You can’t. I’m new to your website as of this season and have been loving it, so thanks! However, I got really into your site this season because I haven’t been following the show closely at all. Do you think that you get a lot of readers who have given up on the show or don’t follow it closely anymore? Comment: I have plenty of readers who say they don’t watch anymore and just follow along with the spoilers and recaps. Seems odd, but I do hear that multiple times every season. As for the percentage break down of readers who do it that way versus those who don’t? That I don’t know. Comment: Outside of production? I can’t think of one particular contestant that has more juice than anyone else. They all talk. All of them. They all have stories. Impossible to say who has the best and juiciest ones. What I do know is I’ve heard a hell of a lot of them. So your answer to all three of those questions is me, but you said besides me, and I can’t think of one in particular. Referring to Lauren Zima as Mrs. Chris Harrison is reductive and kind of offensive. She is a senior producer and shouldn’t be referred to merely by her significant other’s name. By not even including her name at all, you also took away credit she should receive for her work as a journalist in the referenced interviews. Of course it’s relevant that she’s dating Chris Harrison, but there’s ways to include that info while also giving her due credit. I’m sure this wasn’t your intention, but speaking from personal experience, this happens to women way too often and it’s worth correcting. Comment: Well, if you feel that way, I’m sorry, but I think you may have missed the joke. First off, I’m friends with Lauren. I even told her I was gonna make jokes here and there about it just because she’s now part of the story. And secondly, I’ve referred to Chris as Mr. Zima this season and didn’t hear from you then. It’s all in good fun. It’s such an easy joke to make and silly, I didn’t think twice about it. I think people who understand my humor get it. First is more of a statement rather than a question. Last night’s episode is why people watch the show. It was raw, unproduced (mostly), genuine human emotion that almost everyone can relate to on some level. Colton as a Bachelor has been underwhelming for the most part – the guy went on the show to grow his platform and for the opportunities. Then once he thinks he has the show figured out, he actually falls in love. Say what you want about the guy but watching him shake and struggle with the realization that Cassie’s not in love with him was heartbreaking (and brought me straight back to some of my own heartbreaks). And now there isn’t a person that watches the show that isn’t rooting for his love and happiness. Yes, part of the show is stale and tired but gosh, there are still elements of the show that really deliver. Do you think Colton and Cassie will have an even harder time overcoming normal relationship obstacles after the show since a huge part of the public is going to have some serious doubts? Hard to compare it to other relationships, but there’s no way I’m the only person who’s going to be thinking when this is all over that he’s into her way more than she’s into him. No matter WHAT she says next week, there will be skeptics out there thinking it’s only a matter of time before she ends it with him because she’s not that into it. Have you heard anything about how Tayshia and Hannah G. have reacted watching this back? It’s got to hurt feeling like such an after-thought and essentially hearing you were dragged along because of the format of the show, not because Colton was actually invested in the relationships. Ouch. Reading your column from today– I totally agree that it does not matter if people have rants about or hate who is going to be the lead next season. Remember how upset everyone was that Colton was the lead? Well guess what… Nobody is talking about him anymore. (Shocker) They’re only talking about the cast. It’s all about Cassie, Caelynn, Kirpa, Tayshia drama — it’s just like you say every season. And next season we won’t be talkin about the lead either. we’ll be talkin about the men. I wish people would just realize one day how right you are and quit their whining. ?? In other news I’m in a group text with a girl who is delusional about this show. She’s a mess. I thought only older people watched it with such sincerity. I want to spoil her so badly but I won’t. Maybe he eyes will be opened in the future. Comment: “I wish people would just realize one day how right you are and quit their whining” should be my new website slogan. And probably the most important words to live by. Thanks. I agree. I’m grieving with you over the loss of Luke Perry. I was a bit older than the target audience—working full-time and going to grad school at night, but somehow I got sucked into the Brenda-Dylan-Kelly love triangle and “BH” became my weekly indulgence (kinda like The Bachelor is to me now). The world will forever be a little less cool without our Dylan McKay. I don’t think Matt Daddy was too controlling – I think he was super smart to get a free trip to Portugal – but I do think his influence over his adult daughter is a bit odd. She seemed to become a thirteen-year-old girl during that conversation. Usually she seems to at least have the maturity of sixteen. Obviously, he has concerns about her maturity, as well, otherwise he’d have trusted her to make her own decisions. But maybe she’ll never fully mature if he doesn’t start trusting her. I never looked at it as he didn’t trust her to make her own decisions. I looked at it is he was providing her a perspective that she maybe wasn’t seeing because she was wrapped up in that TV bubble to MAKE that decision. But maybe that’s just me. The season did build around the fence jump, but that doesn’t mean the moment wasn’t organic. If something that great happened on it’s own, why wouldn’t they build the edit around it? Did you get a Truman Show feeling when they sent Chris out to have a “Hey, buddy” talk to Colton after he ripped his mic off? I totally get what you’re saying. But there’s so many things about this show and behind the scenes stuff I hear every season, that my stance is I can’t fully take everything at face value when it comes to Colton. I have no notion of skipping the next season of The Bachelorette, but I do fear Hannah’s ginormous clown smile will begin to wear on me and I’ll be forced to fast forward through it like I did whenever Ashley I. cried. Please give Luka a scratch between the ears for me! If she likes that. Otherwise…a rub on the tummy? Comment: She gets it every night. It’s basically a necessity or she whines like no other. Comment: Demi is a wonderful human being, is totally self-aware, she’s going places in this world, and will never, ever be a punch line in this franchise or someone whose career will eventually revolve around numerous reality show appearances. Can’t wait to see her on Paradise this summer because she’ll bring such an exciting, fresh perspective to things at her age with her well thought out, never rehearsed one liners. She’s wise beyond her years and probably the most important character this show has ever seen. Any idea what happened with jade and Liz? She wasn’t at Liz’s wedding. Liz is no longer on the podcast with her and Carly. Comment: No. Well, not until a ton of people emailed me about it this weekend. I had no idea this was a thing and honestly could not care less. Send all links and emails to: steve@realitysteve.com. To follow me on Twitter, it’s: www.twitter.com/RealitySteve. Instagram name is “RealitySteve,” or join my Reality Steve Facebook Fan Page. Talk to you tomorrow. If Juan Pablo and Corrine had a love child, it would be Demi. I’ve hated her all season long. Yes, “hate” is a strong word. Last night’s performance galvanized that for me. The notion that Demi has any fans makes me wonder what kind of people they are too. I wholly agree with you corn29! I had to mute my TV several times last night due to all the screaming over each other, mostly whenever Demi was speaking. She might be the most immature “girl” ever to go on the Bachelor. And I for one LOVED when Courtney gave her the pacifier! The whole WTA show was a huge waste of time. And Hannah B spent the whole time mugging for the camera, working on her Bachelorette audition. Gag. I though what Courtney did to Demi with the pacifier was way, way out of line.That stunt said way more about Courtney than Demi. That being said, I’m not a fan of Demis and think she is immature and an attention addict. Cassie doesn’t care about Colton, at least not that much. She said early on she wasn’t in love with him and didn’t know/think she could get there. She also said early on she was leaving. She waffled after Colton put up such a fuss. She is either a conflict avoider, or people pleaser or both. She is probably with him right now, because she does like him and the show and all. However, I don’t think she is “in-love” with him at all. As for Chris following Colton. You can hear one of the producers saying “Should we call Chris” when he first takes off walking, so there you go. Last night was excruciating to watch. I’ve never been a fan of Demi’s, I just didn’t like her on the series, far too immature, rude and an attention seeker. I know there are others out there that like her one liners etc., but after last nights episode, I really can’t see why anyone could still feel the same about her. Yes, Steve was being sarcastic about Demi, and I miss that part of his humour sometimes…it seems to pop up when I least expect it. Maybe if he used emojis it would help, because at times the written word lacks nuances. I personally don’t think Cassie is that into Colton, I think she could have at least said, yes I adore you etc., I’m just not ready for a proposal yet. But she hasn’t really said anything like that…only that she’s unsure etc. I still think she signed up for the fame as did Colton, but all that said, I do think he was genuinely upset with Cassie after her Father turned up. Those are pretty strong statements. Maybe she is just staying until ATFR, but wow, I dont see how you can overlook that. A couple of issues I have. (1) Does anyone believe that Chris Harrison really followed Colton after the fence jump? The editing made it look like Chris was chasing him, but the choppy edits revealed that whatever film they shot with Chris was done after the fact. Colton may have jumped the fence, circled around and went to bed for all we know. But Chris wasn’t chasing him anywhere. Credit to Colton, because the fence jump was impressive athletically. The guy got up and over very easily. (2) I don’t really have any problem with Cassie’s Dad being cautious or suspicious. The issue I have with him is that he was giving a narrative where two people should meet, immediately fall in love, never have any doubt and that’s the way it should work. Instant soul mates, otherwise it’s not real. Come on. I realize that it happens that way for some people, but I’d wager a bunch that most people don’t have it happen that way. And I think that’s where Cassie was getting hung up. She was dating a guy (on a TV show), having a blast, enjoying the guy…. then boom…. Dad lays the “if you’re not feeling it right now, then it’s not real” trip on her. Maybe it’s not real, but it’s not because they weren’t instant soul mates. It’s not real because the whole premise of the show isn’t real. Dad kind of has his head up his a** if he’s expecting his daughter to have an instant soul mate. I don’t blame Cassie at all for being confused when her biggest roll model lays that on her. Colton was right when he said he was OK to go slow and that every relationship goes at it’s own speed. That’s probably the most intelligent thing he’s said all season. Maybe the ONLY intelligent thing he’s said. Anyway, that whole episode was highly annoying. The best bit was the best line I’ve heard from any parent was by Tayshia’s Dad – ‘You don’t microwave relationships’, was just a fantastic line! It summed up what’s so totally unrealistic about the whole format of the franchise! jlal – Steve was TOTALLY being sarcastic about Demi. I also think we have to give him slack about the Mrs. Harrison joke. I remember him calling Chris Harrison Mr. Zima first, and I think it is a totally fair joke to tease “inter-office dating” on a show spoiler site. As for the person wondering how many people aren’t watching the show but are still reading Steve’s stuff – that is totally me. I might have missed it if it came from something Steve posted, but the Matt F’ing Randolph references go over my head. I’ve been assuming it must be about something said on the show…but I wouldn’t know cause I’m not watching. @tinyred: yes,from a macro level the whole season is very annoying. Like I’ve said before, this season is giving Juan Pah-blow a run for his money for being the worst season ever. I realize there were a lot of other turd seasons earlier on, but I was kind of in and out the first few seasons so I can’t really comment that well on Prince Lorenzo and Alex Michel. I do think Charlie O’Connell was really gross and definitely in the bottom 3, or so. Ben Flatdick is in there somewhere too. WTA was awful, and a perfect finisher to this season. Awful season, super immature contestants, and that one was a major issue. Girls, you don;t have to be rude, cruel and gang up on other girls to be strong. Don;t do it. Yet, there they went. And Hannah B? Just no. The girl is not bright, not very articulate, not quick on her feet thinking wise. That elevator does not go to the top floor intellectually. Or the top 3. Her season would be her making weird open mouth faces, doing that beast thing, and being mostly perplexed all season long about how it works. We didn;t watch the last Bachette season and won;t watch Hannah B either. Give us Hannah G. Classier and she’ll be a better season. Logo65, happy you caught the I love you, but not in love with you line.. Also, the you deserve someone who loves you (paraphrasing). Because just those two lines says it all about how Cassie feels or rather doesn’t feel. Not saying she doesn’t like him,but she does not feel deeply about him. I also am not a fan of Hannah B. Didn’t see much of her because I tuned in and out until the last couple of shows, but she is annoying. A couple of months into dating, my fiance pretty much said the same thing to me. 4 years later we’re getting married in September. We laughed at that together when watching. > Steve was TOTALLY being sarcastic about Demi. I missed that too; I guess I don’t have the sarcasm font installed on my laptop. Ha! > a run for his money for being the worst season ever. Nick’s SEASON was the worst. JP was the worst BACHELOR. > I also am not a fan of Hannah B.
I was a HUGE fan of her dress last night though. Wow!!! My ears were bleeding at that WTA. What a bunch of screechers! Demi is so annoying, I had to fast-forward through all her segments. She’s not even funny. I’m surprised none of the women did an “I told you so” at Colton – he picked the one girl the others had been warning him about. No sympathy for him, and Cassie is a nitwit. I like Hannah B as Bachelorette. Should be fun and lively – she’ll put it all out there. I don’t think Cassie is “flipping the bird” at her Dad at all. He didn’t want her to get engaged after a few weeks if she wasn’t sure. Dating someone is totally different. Agree that the WTA was hard on the ears. I too had to turn the volume down and tune out during the screeching sessions. So happy RS was being sarcastic. I usually have pretty good sarcasm meter, but missed that one. I too took longer than my husband to “fall in love” and it wasn’t until we broke up for three months at the 2 year period, that I realized just how much he meant to me. Best thing that could have happened.Together a total of 18 years now. So, maybe Cassie will come around but I doubt it seriously. Okay, I just have to ask how anyone could’ve taken RS seriously when he wrote that paragraph about Demi. He’s been writing all season about how annoying and immature she is and how she’s doing a Corinne 2.0 and how even at the WTA she was just doing her act, and I guess apparently he had some Twitter exchange with her. I mean, c’mon! Daddy-Love-killer said if Cassie should know right away and there should be no hesitations when you meet the right person and the longer Cassie drags it on, she’s doing a disservice to herself and Colton. If that does not say break up with him now, I don’t know what is. Thank you for sharing your love story Corn. I don’t know about everybody else, when I’m not into a guy I’m with, I don’t shed a tear when I break up with him. @justsaying: you are exactly right! Dad was giving a pretty unsubtle message to Cassie that she should break up. First, he threw in the confusing statements about how he and his wife (Cassie’s Mom) always “knew” from Day 1. Then points out that Cassie doesn’t “know”. Casts doubt about how she could not “know”. Then tells her that she should “follow her heart”…. after clearly attempting to show her that her “heart” wasn’t in love…. after 6 weeks…. on a TV program. That’s kind of manipulative, don’t you think? I do hope Cassie stands up to her Dad, regardless of where things go with Colton. She has to develop her own mind where she doesn’t get talked out of a non-abusive relationship by her Dad. Look, these “engagements” on the Bachelor are phony. The vast majority break up within 6 months, many within a few weeks after the final airs. Chill out Dad. It’ll all play out fine one way or another. They’ll likely break up. But if they get married they will have beat long odds and the love will be real. I was originally thinking that the decision by producers to get Cassie’s Dad on the program was a story line killer and a show killer. A big mistake. But the show is getting lots of attention on social media, so ratings will probably be really good next week. I guess they do know what they’re doing, as annoying as that is to say. @rob22 Thank you! I’m not saying Colton and Cassie forevah and evah but give them a friggin chance, daddy-double-m (m for manipulate and m for meddler). Before meeting up with Colton that night, poor Cassie said along the lines I know what I have to do now. I have leave. There’s already so little love in this world, daddy-double-m. Let Colton and Cassie have at it. Nothing wrong with that. What kind of person am I @jp22? One with respect and integrity. Something comepletely lost Demi… and apparently you. Troll on pal.